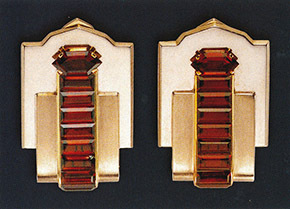 The old Sanskrit word “tapas,” or fire, is the root word from which the modern name Topaz is derived. Red Topaz is one of the most rare color of all the colorful topaz gemstones therefore it is extremely valued. The largest faceted red topaz found to date, in the world ,is an oval brilliant cut gem which weighs 70.40 carats. The color is natural and a deep red, the origin of the stone is from Brazil or from the Soviet Union. So why do we call yellow and yellowish brown gem stones Topaz when the name is derived from a reddish orange color? This error of using the name of Topaz for all yellow stones, stones that are actually quartz, dating back to antiquity. Most citrines and brown quartz are sold under the names of Topaz. This has created some confusion about the gemstone Topaz. 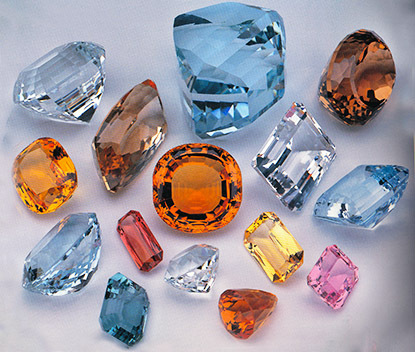 However the color of topaz is generally much warmer in luster and tone with an orange or pinkish ‘overtone’ color than that of any quartz stones. The names quartz topaz, smoky topaz, scotch topaz and Madeira topaz are all misnomers, and generally do not refer to real topaz. ‘Precious Topaz’ is the term reserved for a true gem topaz that has the color of a peachy-champagne tone and an intense golden to reddish orange called ‘imperial topaz’. In ancient times the gemstone peridot was found on an island in the Red Sea named Topazos, which means ‘to seek’ because the island was very difficult to find, the island is now known as Zebriget, (refer to the August Birthstone post Peridot). Topaz crystals are found in cavities in rocks such as granite or rhyolite. Topaz is composed of silicate of aluminum containing fluorine and hydroxyl. Gem quality topaz is mostly found in pegmatite dykes. Topaz crystalstypically form prisms with a diamond shaped cross section and a pyramidal top.One of the largest transparent topaz was found from Minas Gerais, Brazil, currently on display at the American Museum of Natural History in New York. Gem quality Topaz crystals can grow to an unbelievably huge size. Larger than any other gem crystals, the topaz world record is at 597 lbs. Egyptians and Romans obtained their topaz from Sri Lanka and believed it would strengthen the mind and prevent mental disorders as well as sudden death. For eye ailments the prescription called for immersing the gem in wine for three days and three nights followed by application of the topaz to the afflicted eye. A topaz engraved with the figure of a falcon could help its bearer cultivate the goodwill of kings and princes. A cure for madness, the topaz could increase one’s wisdom and prudence, a coolant for excessive anger. Mot topaz mined is completely colorless and transparent. A very slight pale grey blue color is also found in abundance in nature; however, most blue and dark blue topaz sold today is actually irradiated white topaz. A sea green color topaz resembling the aquamarine is mined in Russia and is a rare color. Topaz crystals in brown, orange and yellow brown, known as ‘sherry topaz’ and vivid pinkish-orange to red-orange known as ‘imperial topaz’ are found only in Brazil. A pink topaz may look very similar to a kunzite, morganite and pale pink tourmalines, but with a closer inspection you can see the warmer luster, tone and more intense colors at both ends of the topaz. Some of the sherry colored topaz from Japan and the Ukraine may fade permanently to almost colorless when exposed to sunlight. Although topaz is an 8 on the Mohs scale of hardness, it will break easily at right angles to the length of the crystal if it has a knock or blow to the edge of the stone. Most topazes are cut into long oval or pear shapes because of the prismatic shape of the crystals to bring out the luster in the stones. The longer the cuts of the stones are the color will look darker at both ends; this is a good indicator to identify a true topaz versus a quartz stone. Topazes need to be treated with care. One of the earliest known sources of topaz was thought to be from Saxon Germany. The crystals found there were a pale wine-yellow color and was traditionally one the most sought after topaz for many years. In the Middle Ages in Europe the gem topaz was not very popular and was mainly used for ecclesiastical or royal jewelry. By the eighteenth century in Spain and France the topaz became popular worn with diamonds. In the nineteenth century topaz and amethyst became the most fashionable gems for earrings combined with pearls. During the Victorian era and later into the Art Deco era topaz was extremely popular with the yellowish orange color being the favorite. One of the most incredible topaz items, and one of my favorites which was on exhibit at the Legion of Honor in San Francisco for the Artistic Luxury is a topaz vase. Russian Grand Duke Alexei Alexandrovich gave this carved topaz vase from the House of Faberge to Elizabeta Baletta, prima ballerina at the Imperial MikhailovskyTheater in St. Petersburg in 1900. The topaz is finely polished to complete transparency and polished to perfection, the gem resembles glass with a beautiful warm golden brown color. 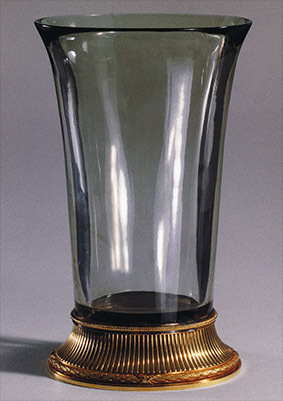 This simple cut topaz vase is mounted on a gold base.